The Rancho Bernardo Brokers Association is a group of Real Estate Brokers and Agents who represent buyers and sellers of residential real estate in the San Diego community of Rancho Bernardo. The group is represented by the major brokerages doing business in Rancho Bernardo and is supported by a group of key business affiliates. The primary function of the Rancho Bernardo Brokers Group is to conduct a weekly broker meeting and open house caravan where new listings are presented and showcased. The Rancho Bernardo Brokers Group also addresses issues and activities that have a common interest to the group. For example, the group deals with community rules and regulations related to real estate activities and provides support to community groups. Bret Geernaert, Coldwell Banker Residential, has just assumed leadership of the Rancho Bernardo Real Estate Brokers Association. Geernaert will succeed George Cooke, Coldwell Banker Residential, who has led the group for the past 8 years. Cooke says, "I selected Bret as my replacement because of his involvement in Rancho Bernardo community associations. He is a fine agent and he has some great ideas to take this already vibrant organization to a new level." The announcement was made at the Rancho Bernardo Brokers Meeting on April 19. George was thanked by the real estate members and affiliates in attendance for his dedicated service to the success of the group. George assured the group that he would still be active in the association but had decided it was time to turn over the leadership of the group. Geernaert said he was honored to be selected as the new director. According to Geernaert, "The Rancho Bernardo Real Estate Brokers Association is one of the most active real estate groups in San Diego County, due in large part to the involvement and support of its many real estate members and affiliates. George has done a great job of leading this group for the past 8 years, and I'll do my best to keep the organization strong and growing." The Rancho Bernardo Real Estate Brokers Association is an organization that represents all the real estate offices doing business in Rancho Bernardo. It meets weekly and gives real estate agents and brokers the opportunity to showcase their new listings. It also works to establish and maintain real estate rules and procedures in the community, such as the size and placement of signs. The Rancho Bernardo Brokers Association takes an important interest in the needs in the community and its members regularly donate services and financial support to community projects. Information can be seen in the website at www.RBcaravan.com. 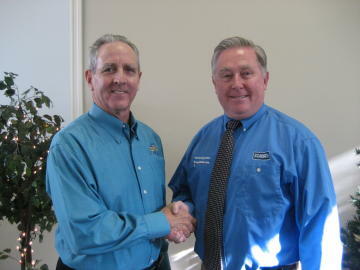 (Left to Right) George Cooke, Immediate Past Director; and Bret Geernaert, the new Director. The article to the left is reprinted from the December 24, 2009 issue of the RB News Journal (Pomerado News). George Cooke, Coldwell Banker Residential, will assume leadership of the Rancho Bernardo Real Estate Brokers Association on January 1, 2010. Cooke will succeed Don King, RE/MAX Rancho Bernardo, who has led the group for the past 15 years. King says, "I selected George as my replacement because he is really dedicated to Rancho Bernardo. He is a fine agent and he has some great ideas to take this already vibrant organization to a new level." The announcement was made at the Rancho Bernardo Brokers Meeting on December 17. Don was thanked by the real estate members and affiliates in attendance for his dedicated service to the success of the group. Don assured the group that he would still be active in the association, but had decided it was time to turn over the leadership of the group. Cooke said he was honored to be selected as the new director. According to Cooke, "The Rancho Bernardo Real Estate Brokers Association is one of the most active real estate groups in San Diego County, due in large part to the involvement and support of its many real estate members and affiliates. Don has done a great job of building this group through the years, and I'll do my best to keep the organization strong and growing." The Rancho Bernardo Real Estate Brokers Association is an organization that represents all the real estate offices doing business in Rancho Bernardo. It meets weekly and gives real estate agents and brokers the opportunity to showcase their new listings. It also works to establish and maintain real estate rules and procedures in the community, such as the size and placement of signs. 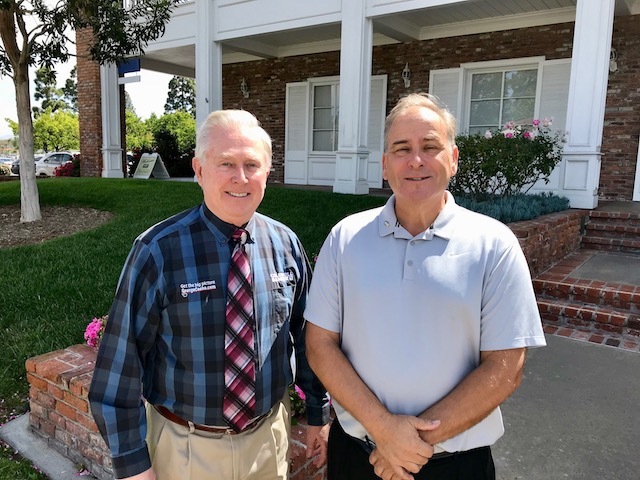 The Rancho Bernardo Brokers Association takes an important interest in the needs in the community and its members regularly donate services and financial support to community projects.